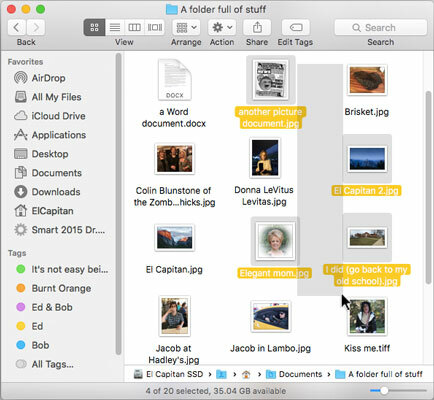 Sometimes you want to move or copy several items into a single folder in OS X El Capitan. The process is pretty much the same as it is when you copy one file or folder: that is, you just drag the icon to where you want it and drop it there. But you need to select all the items you want before you can drag them en masse to their destination. If you want to move all the files in a particular folder, simply choose Edit→Select All or press Command+A. This command selects all icons in the active window, regardless of whether you can see them onscreen. If no window is active, choosing Select All selects every icon on the Desktop. Click once within the folder window (don‘t click any one icon), and drag your mouse (or keypad) while continuing to hold down the mouse button. You see an outline of a box around the icons while you drag, and all icons within or touching the box become highlighted. Click one icon and hold down the Shift key while you click others. As long as you hold down the Shift key, each new icon that you click is added to the selection. To deselect an icon, click it a second time while still holding down the Shift key. Select more than one icon by clicking and dragging with your mouse (or trackpad). Click one icon and hold down the Command key while you click others. The difference between using the Shift and Command keys is that the Command key doesn’t select everything between it and the first item selected when your window is in List, Cover Flow, or Column view. In Icon view, it really doesn’t make much difference. To deselect an icon, click it while holding down the Command key. After you select the icons, click one of them (clicking anywhere else deselects the icons) and drag them to the location where you want to move them (or Option-drag to copy them). Be careful with multiple selections, especially when you drag icons to the Trash. You can easily — and accidentally — select more than one icon, so watch out that you don’t accidentally put the wrong icon in the Trash by not paying close attention.